Shop your fridge for your next face mask. Skincare can all be a little extra: ampoules, peptides, 10-step routines?! It can all be overwhelming, but stress not, friend, let’s go back to the basics. Or actually, let’s go over to the fridge. 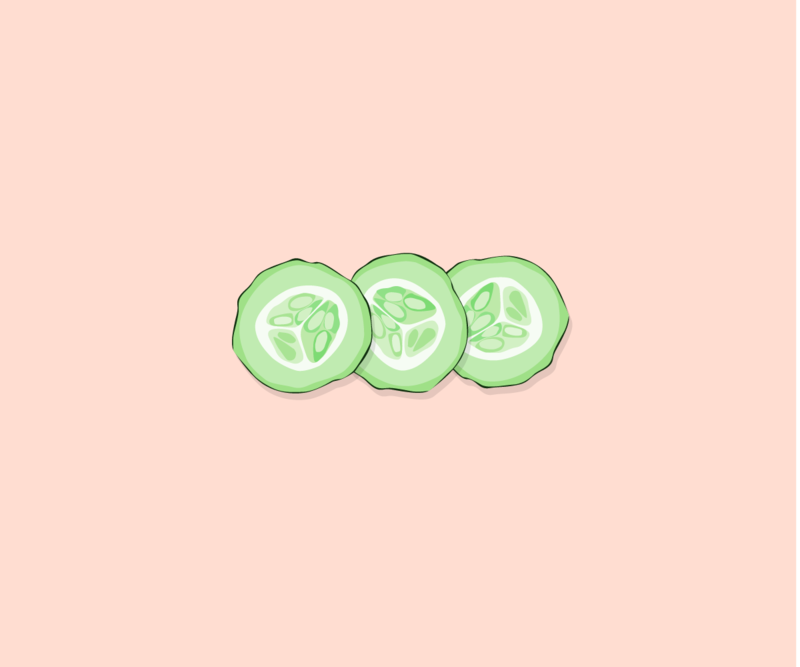 Not for a snack, but rather for your next face mask. Everything you need for treating your skincare woes is probably already sitting in your kitchen. Read through for some of nature’s most powerful beauty ingredients to help you shine on. In the words of Mariah Carey, “I can’t be elusive with you honey.” And nor should you, as it’s nature’s miracle—proven antibacterial properties (due to the hydrogen peroxide it contains), soothing, and a wide array of anti-aging vitamins and minerals. Honey is a great way to both purify and moisturize skin, and it’s also an all-natural humectant, helping your skin to retain its own moisture. But there is a honey above the rest in its effectiveness: Manuka honey from New Zealand, produced by bees that pollinate the native manuka bush, which make it even more effective at healing. But that power does come at a price—it’s more expensive than traditional honeys. A small amount will get you far, but feel free to sub in high-quality normal honey if you don’t want to spend on Manuka. Apply a thin layer on your face and leave on for five minutes before washing off. Commonly used for a super boost in smoothies, spirulina is a blue-green algae rich in protein, vitamins, minerals, and antioxidants. All of these protect cells from damage, making it great at anti-aging, and also adding a radiance boost in a mask. Spirulina also has a protection element: It can prevent the aging effect of airborne pollutants. Mix together into a paste, apply on the face, and leave on for 5-10 minutes. Wash off using a muslin cloth or washcloth. Ice, ice (that skin) baby. Icing your skin is one of the most effective (and cheapest!) way to de-puff your face. It effectively promotes circulation and gives an amazing glow. But it’s no new revolution: Joan Crawford (and in modern day, Kate Moss) was known to dunk her face in an ice water bath every morning for taut skin. There are a few ways to go about it at home: Soak your face in ice water for 10 second intervals, or wrap an ice cube in a tissue or muslin cloth and gently run the cube over your face until it melts. To take it to the next level, dice up lemons, put them in water, and freeze them into ice cube to use for your next ice massage. It’s excellent for brightening and pigmentation issues, plus the scent and coldness will instantly wake you up. What’s good for your stomach is also good for your skin. Yogurt contains lactic acid, which hydrates, exfoliates, and brightens, and smoothes rough and dry skin. It’s also a great antibacterial agent, due to the zinc in it, so when used as a mask it helps soothe blemishes and reduce impurities—plus it’s great on sunburns. It’s as easy as applying a few tablespoons of full-fat, unflavored, unsweetened (ideally) Greek yogurt (it’s full of live bacteria, protein, and amino acids) right on the face for 10 to 15 minutes before washing off. If your skin is dry, you could add a teaspoon of honey to the yogurt. For oily skin, a squeeze of lemon juice is a great addition before smearing on the face. Packed full of omega fatty acids, antioxidants, and vitamins C, E and K, the humble avocado is a powerhouse, not only beneficial to our bodies when eaten, but also valuable to our skin and hair too by softening, nourishing, repairing, and protecting when applied topically. Mash up into a paste, apply, and leave on the skin as a moisturizing mask for 10 to 15 minutes. Or for the ultimate under-eye moisturizing mask, cut an avocado up into slim slices and place a segments under each eye. Lie down, and leave to work for about 15 minutes. Effective when drunk, but also when used topically, green tea is an all-round miracle cure. A plentiful source of flavonoids, it’s great for anti-aging and to repair sun damage, but it’s also especially calming for psoriasis and rosacea. Take a page from Lisa Eldridge, Creative Director of Lancome Makeup, and all-around wonderful human being, who has a brilliant hack for puffy and tired eyes with green tea. You could also use cold or frozen water-soaked green tea bags for a quick de-puffing solution too.